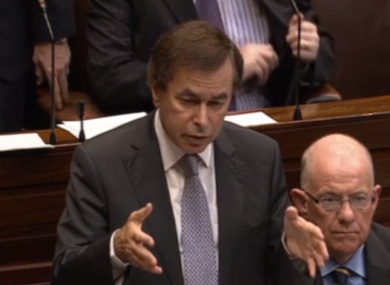 JUSTICE MINISTER ALAN Shatter has told the Dáil there was “fault on both sides” of the garda whistleblower controversy, admitting that Maurice McCabe “wasn’t directed to engage” in the penalty points investigation, but was “invited” to do so. Answering questions from TDs in the Dáil this evening, Shatter also claimed that he did not “recall or remember” that Oliver Connolly gave his campaign a €1,000 four years before he appointed him to the role of garda confidential recipient. Shatter said he had expected that McCabe would have engaged in an internal garda inquiry into alleged malpractice in the penalty points probe, but admitted he “wasn’t interviewed by those dealing with the issue”. “My expectation was that he would be engaged, and he would be interviewed,” Shatter said. He admitted that McCabe “clearly wasn’t directed to engage, but he was invited to engage” and said there was “fault on both sides” of the issue from both the gardaí and the whisteblower. He continued to insist he did not cast aspersions on McCabe, or fellow whistleblower John Wilson, in saying they did not cooperate with the penalty points probe – as he told the Dáil last October – and rejected calls from the opposition to correct the Dáil record. Shatter accused opposition TDs of trying to “cherry-pick the bits that fit the narrative”. He also expressed concerns that McCabe had recorded conversations he had with both the confidential recipient Oliver Connolly and a conversation he had with a chief superintendent in Mullingar Garda Station on the 14 December 2012. The Minister said he did not “recall or remember” that Oliver Connolly had donated €1,000 to his election campaign in 2007 when he appointed him as garda confidential recipient in 2011. Connolly was sacked as garda confidential recipient last week after he failed to repudiate reported comments he made to McCabe about Shatter ‘finishing’ the whistleblower. Having made no reference to the issue in his earlier speech, Shatter told Fianna Fáil’s Micheál Martin that Connolly’s €1,000 donation in 2007 “had nothing to do” with him later being appointed as confidential recipient. “I didn’t actually recall or remember that at the time,” Shatter said, adding that Connolly was “a well-known counsel” with a “high reputation”. He described him as “an ideal person” for the role. He said he found it “quite extraordinary” and “highly inappropriate” that Connolly was reported to have told garda whistleblower Maurice McCabe: “If Shatter thinks you’re screwing him, you’re finished”. “Under no circumstances would I take that approach to any individual,” the Minister insisted. Asked if he would distance himself from comments by Garda Commissioner Martin Callinan at the Public Accounts Committee last month that the actions of the whistleblowers were “disgusting”, Shatter said he had not read the transcript of the commissioner’s remarks. Earlier, the Dáil heard a series of statements from government backbenchers and opposition TDs. Socialist Party TD Joe Higgins said that McCabe had been “victimised, isolated and slandered”. Fine Gael party chairman Charlie Flanagan said it was important that the inquiries underway be allowed to proceed unimpeded and said that the gardaí should not be referred to as a ‘force’ but as a ‘police service’ as “they serve the people”. Fianna Fáil’s Niall Collins pleaded with Shatter “to look within yourself” and apologise to McCabe for his treatment, while Fine Gael TD Noel Coonan accused opposition parties of “denigrating An Garda Siochána”. Sinn Féin’s Padraig Mac Lochlainn compared the failure of Assistant Commissioner John O’Mahoney to engage with McCabe during his inquiry into the penalty points system as akin to gardaí investigating an alleged crime without interviewing the victim. Email “Shatter: I didn't 'recall or remember' Oliver Connolly's €1k donation when I appointed him”. Feedback on “Shatter: I didn't 'recall or remember' Oliver Connolly's €1k donation when I appointed him”.